My name is María Soledad Morales Montenegro. I am married, have one son, two daughters and one grandchild. Like many people, I believed in God, but did not have a personal relationship with the Lord. I found out, when my oldest son was 14, that he was using marijuana. Although this disturbed me, I consoled myself that this was only temporary and just the characteristics of adolescence. (God, in His mercy, uses our vain experiences to turn our eyes to Him). My son looked good, he was studious and hardworking, so I did not pay him due attention. The years went by. (Without God, we are blinded.) When he was 27 years old, I noticed him to be very thin. He confessed he was using crack cocaine and could not stop. He began to fail at work and filled with anxiety, he stole things from the house. He disappeared for weeks. I was desperate. Then my friend showed me the Moms in Prayer flyer that read, “Mama, will you pray for me?” This phrase really confronted me because I had never influenced my children spiritually, only on academics. I was convicted, but at the same time, it was like a voice of hope. God led me to a personal transformation. I was confronted with Psalm 37: 4: “Delight yourself in the Lord; And He will give you the desires of your heart.” I focused on the second part (“grant the desires of my heart”), but did not realize that there was a requirement. I started to pray and ask the Lord how he could delight me? Then I understood his answer: obedience. It was from there that I began to delight in obedience to God. Then I received the call that he had been arrested. I spent three days in great pain and mourning. I fell into a deep sadness. However, in Philippians 4:13 God encourages us to be strong in Christ. That verse rumbled in my soul and the pain lessened. I prayed for him to stop the drugs, but when I prayed with the Word, I understood that more than drugs, my son had a sin of pride. He rejected his family and comfortable bed for sin. In his arrogance, he blamed the family and society. In prison where he had to sleep on the floor, he accepted that it was his decision to consume the drugs. Now my son is a forgiven, grateful person who seeks the Lord every day for guidance. but God knows the true need. God called me to Moms in Prayer. Praying in a group has given me much peace and now I influence my grandchild’s life for Christ! I understand that my responsibility to God is to impact my children and grandchildren’s lives by praying His will for each one. Today, my whole family walks with the Lord. 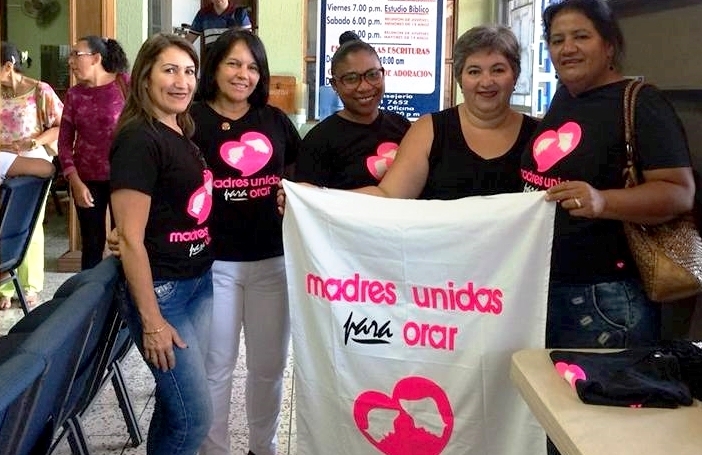 Will you help bring María, Costa Rica Area Coordinator, to the Moms in Prayer Awaken Hope 35th Anniversary this year? She will join women from every continent to be equipped and inspired and to pray together for an outpouring of Moms in Prayer groups in her country.